Mama of 10 : Note to Self.....Don't Try "_" Again! Note to Self.....Don't Try "_" Again! Don't feed the messy meals at breakfast or lunch, instead save them for dinner so you put those little guys right into the bath! 1. Don't sign up the kids for too many extracurricular activities. Believe me, you will regret it when you are all running around all the time like crazy and the child ends up not liking anything he or she is doing. 2. Don't get a puppy when you have a newborn or even towards the end of a pregnancy. It seems like it would be easy and the other children say they will handle everything that concerns the little puppy, but believe me, you as the mom will be doing double the work....I promise. 3. The family bed. I love my children, and I do let newborns sleep with me if they are still up nursing a lot. But I like my babies to like their beds and all of my babies have slept better in their own little crib. If my babies smell me, then they want to nurse. It's just instinct, but they may not really be hungry. The marriage bed is very important for a strong marriage. Most husbands I know agree with me : ) Just remember if you do try this, that your husband is your first love and you both need time away from your precious little one. 4. Homeschooling year round. I know many families that do this, but for me it totally back fired. I can do a little bit of school in the summer, but we all need a break. My kids get so excited in the fall to start school and are always eager to get going with their new school things. When we tried to keep it up all summer, we completely lost this excitement and we all started up school for the year a little burnt out. 5. Don't try to drive more than 10 hours in a day with little ones. It's just not worth it to me. And don't try the "load the kids up at 10pm and drive through the night thingy." It is never worth it to me either. The next day you are both exhausted and grumpy and the kids didn't really sleep well either and are so out of sorts. 6. Don't ever force a child to attend a certain school. I tried this with a preschool once.....disaster! I also did this for a few years with a highschooler and he was just miserable. I know sometimes you may have to put your kids in school or in a certain school they do not want to attend, but unless it is something you HAVE to do, don't. One think that I find myself pointing out to new stay at home moms is to never give their friend time. I encourage them to find a group of friends to learn with, pray with, teach with. I would not suggest having male friends but giving yourself permission to meet up with a few girlfriends to exercise or have coffee. What ever it is, they need to be from your state in life - good if they are also SAHMs and homeschool if you do. Love your blog when I get the chance to visit, by the way. I totally agree with the not driving through the night thing. I have never understood that notion and am not brave enough to try it out. Love your list and your blog. I agree with not allowing your babies and kids to sleep with you. I just had my 7th baby and have never been able to have the baby in the same room with me. My babies have normally started sleeping through the night by 2 or 3 months which makes life a lot easier to manage when there are so many little ones to deal with during the day. People always wonder how I do it and I think a lot of it has to do with the fact that I normally get a good nights sleep. 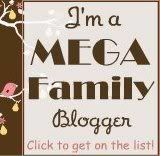 Love your blog and enjoy reading it. Great list. I can testify to the pitfalls of these, from experience: the puppy/new baby thing, the drive through the night thing, the marriage bed. Totally agree. I would add, Never never never allow glass dishes on the patio. I mean the baby in the marriage bed. I totally agree with almost everything, except the homeschooling thing, since I am not a homeschooling mom. Great tips!!! Benji, my two year old, has OT therapy around 10:30 in the morning. This is the therapy that the therapist wants to work on feeding, etc. He is practicing feeding himself during this session. And I always have him completely bathed and fully dressed. He always needs a new outfit and clean up after this. I think I am going to just wait to get him ready after this!!! Not sure why I haven't thought of this before. I agree with all! Especially about school. I pulled my daughter out of a nice Christian preschool when she was 4. She was only there 7 hours a week but she made it clear she didn't like it. The main teacher had to take a medical leave and I believe she sensed the change. I got some flack from family about "letting her call the shots". When you follow your gut, there are no regrets and I am so happy I held my ground. Today she is 7 and loves school! I have four kids and for the first time we are doing fall sports. The boys are on the same tee ball team so that is nice but I have one daughter playing school field hockey and the other one is playing soccer. The only other extracurricular we have besides these teams is Wednesday night Missionettes and Royal Rangers- I call them Christian girl scouts and boy scouts. I feel like we are always out of the house and it is hard when my husband has to take the boys and I have to take one of the girls to separate sporting events. What do you do to lighten the load when you say not to sign up kids for too many extracurricular activities? I feel like each kid being in one sport and then Wednesday night church is not a lot, but we never seem to be home. I am very interested in how you guys balance. Also, kudos to kristy for getting her kids to sleep through the night so young, but for me it seems like until I stop nursing completely the kids are always waking at night. I know it can be really hard. I love Royal Rangers too. My older children went through that program.